The awards honor 50 select second-stage companies throughout the state for developing products and services, creating quality jobs, enriching communities, and broadening new industries. Chosen from a candidate pool of 134 businesses, the finalists collectively represented $518 million in annual revenue and employ 2,743 full-time workers. Developed by the Edward Lowe Foundation, “Florida Companies To Watch” is a distinguished awards program specifically designed to seek out second-stage businesses from a wide range of industries representing all areas of the state, not just those in major metropolitan areas. “Florida Companies to Watch” recognizes the different approach needed to successfully grow and scale a business and celebrates those that are working to achieve this goal. The winners will be announced in mid-September. The 2018 honorees will be celebrated at the awards ceremony Feb. 9 at the Straz Center for the Performing Arts in Tampa, FL. “We applaud these first-round finalists who have shown how they stand out in their regions as innovative business leaders, going to the next level to grow their companies,” said Dr. Tom O’Neal, GrowFL Executive Director. The Vac-Tron Low Profile XDT unit is powered by a 24 HP Kohler diesel engine and comes standard with 500 to 1200-gallon debris tank, 100 to 400-gallon water tanks capacities with 3500 psi @ 4 gpm, hydraulic rear door, the patented (Big Red) CVS filtration system that is unmatched by our competitors, a reverse pressure system and a heavy-duty I-beam trailer with Dexter torsion axles. This unit also offers the NEW 6-way hydraulic boom design or optional strong arm to maximize job performance by supporting the weight of the vacuum hose. Vac-Tron Equipment, the industry innovation leader in industrial vacuum and vacuum excavation equipment. In honor of National Safe Digging Month – we’re highlighting vacuum excavation as one of the safest ways to uncover underground utilities. We made digging safer! 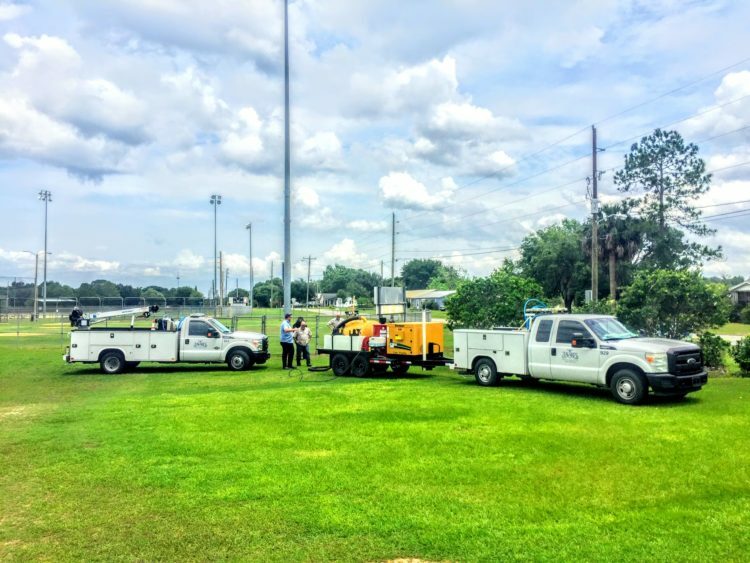 Watch this video as Vac-Tron safely and efficiently exposes underground utility lines for the City of Leesburg. We look forward to seeing you at the UCT (Underground Construction Technology) Conference & Exhibition in Fort Worth, TX at the Fort Worth Convention Center. The dates are January 31 – February 2, 2017. Vac-Tron at Booth 315 will be showcasing the all new PTO Hydro Vac Truck! Individuals representing water, sewer, gas, telecom and electric rely on UCT to learn about the latest techniques used in trenchless, open cut, new construction, and pipe rehabilitation. Major academic and industry sponsors offer seminars before and during UCT.